Kevin Eberhart connected on his second game-winning field goal of the month, hitting from 45 yards out with no time remaining to give Colorado a 27-24 upset win over No. 3 Oklahoma. A homecoming crowd of 50,031 witnessed the Buffs rally from 17 points down (the fourth largest comeback in CU history) to pull off the upset. Oklahoma, which had been averaging 61.5 points and 562 yards per game, was held to just 24 points and 230 yards by a Colorado defense which more than held its own throughout the sun-filled afternoon. For much of the game, it appeared that the Buffs would play just well enough to lose to the talented Sooners. In the first quarter, Oklahoma, which had no more than two three-and-outs in any of its first four games of the season, was held to two three-and-outs to open the game. The Colorado offense was only moderately more successful, gaining a first down on each of its first two drives before punting. On Colorado’s third possession, a Cody Hawkins’ pass was tipped and subsequently intercepted by Sooner safety D.J. Wolfe. Wolfe returned the interception to the CU 11-yard line, and three plays later Oklahoma quarterback Sam Bradford completed a 13-yard touchdown pass to Juaquin Iglesias to give the Sooners a 7-0 lead with 1:40 left in the first quarter. After the teams traded punts to open the second quarter, Colorado put together a 69-yard drive to tie the score. The eight play drive included a 20-yard pass from Hawkins to Hugh Charles on a third-and-one at the CU forty yard line, and was culminated by a 25-yard scoring run by Charles. Before the cheers from the Homecoming crowd had completely left Folsom Field, however, the Sooners were back out in front. Oklahoma needed only three plays to cover 80 yards to retake the lead. Halfback Allen Patrick scored on a 34 yard run to give the Sooners a 14-7 lead less than a minute after the Buffs had tied the score. Just before the half, the Colorado defense made a stand which at the time just seemed to be a consolation for the 22-point underdogs, but would prove to be a game-saving stand. The Buff offense punted after three plays following the Sooner touchdown, and the Sooners proceeded to put together their only sustained drive of the game. Covering 72 yards in 11 plays, Oklahoma marched from their own 16 to the Buff 17-yard line with just over a minute before halftime. A touchdown would have put Oklahoma up 21-7 at the half – with the second half kickoff going to the Sooners. Instead, the Buffs’ defense held, forcing a 28-yard field goal. Down 17-7 at the half, the Buffs were holding their own against the third ranked team in the nation. Colorado had six first downs; Oklahoma had eight. Total yards were almost even, and the Buffs on offense were holding the ball at least long enough in each possession to keep the vaunted Sooners’ offense off the field. But for the Hawkins’ interception giving the Sooners a short field for their first touchdown, the game would have been even closer. Dreams of a quick Buff comeback, though, were quickly dashed early in the third quarter. After forcing a Sooner punt to start the second half, the Buffs took over on their own 33 yard line. On third-and-en, Cody Hawkins’ pass was again tipped, and was again intercepted by OU safety D.J. Wolfe. This time, Wolfe returned the pick to the Buff 17-yard line. After taking three plays to score after the first interception, the Sooners were even more efficient on their second opportunity. Oklahoma needed only one play to capitalize of the turnover, with Allen Patrick running the ball in to give Oklahoma a 24-7 lead with 12:23 still left in the third quarter. The Sooner faithful, a solid block of red in the northwest corner of Folsom Field (with plenty of red sprinkled throughout the rest of the stadium), felt they could finally relax. The rout was on, and, after the Buffs punted the ball back to the Sooners after only five plays on Colorado’s next possession, it was time to sit back and listen to numerous renditions of “Boomer Sooner” from the Oklahoma pep band which had made the trip from Norman. But a funny thing happened on the way to the rout. Someone forgot to inform the Colorado players. The Buff defense held the Sooners on OU’s next possession, and the Colorado offense then put together a 10-play, 50-yard drive. The scoring drive was culminated by a 41-yard field goal by Kevin Eberhart, his first successful kick of over 40 yards on the season, pulling the Buffs to within 24-10. Things began to get interesting two plays later, as Oklahoma quarterback Sam Bradford missed an open receiver streaking down the middle of the CU defense. The errant pass was picked off by Buff safety Ryan Walters, and the Buffs were back in business at their own 38-yard line late in the third quarter. The Colorado rushing game, which to that point in the game had been held to under 50 yards total, began to click. Byron Ellis and Hugh Charles began picking off chunks of yardage: Ellis for five yards; Charles for 10 and a first down; Ellis for 12 yards and a first down; Charles for 23 yards and yet another first down. The quarter ended with Colorado facing a third-and-goal at the Oklahoma four yard line. An incomplete pass attempt from Hawkins to Dusty Sprague left the Buffs with a fourth-and-goal. Forgoing a field goal which would have pulled the Buffs to within 24-13, head coach Dan Hawkins decided to go for the touchdown. His faith in his offense was rewarded a few seconds later when Cody Hawkins hit tight end Tyson DeVree for a four yard touchdown. 24-17, with 14:50 still to play. The third-ranked Sooners were now in a dogfight. The Oklahoma offense went nowhere on its next possession, though, with the drive halted by a Jordon Dizon sack of quarterback Sam Bradford to force a punt. The Buffs took over at their own 36-yard line after an interference penalty on the punt return attempt. Nine plays later, the Buffs had driven all the way to the Sooner 19-yard line, with the drive including another fourth down conversion, this time with Cody Hawkins hitting Patrick Williams for a nine yard gain on fourth-and-four at the Sooner 36-yard line. At the 19, the Buffs faced a fourth-and-two with 6:37 remaining. This time, Hawkins opted for the field goal attempt, but Eberhart’s 37 yard attempt hooked to the left in the swirling winds. Rather than take advantage of the reprieve, the Sooners instead gave the Buffs new life. On the first play after the missed kick, OU quarterback Sam Bradford was intercepted by CU safety Daniel Dykes, giving the Buffs the ball a the Sooner 43-yard line. Three plays later, though, the Buffs were back on their side of midfield, and had to punt the ball back to Oklahoma. Once again, though, the Sooners could not hold onto the ball. Matt DiLallo’s punt was muffed by Reggie Smith, with the ball recovered by long snapper Justin Drescher at the Oklahoma 16 yard line. The Buffs had a golden opportunity with 4:44 remaining. Three plays later, the game was tied. Hawkins hit Dusty Sprague from 15 yards out, tying the score at 24-24 with 4:05 to play. At this juncture, it was anyone’s game. The Sooners, though, could not take advantage of their opportunity to salvage the win against their inferior opponent. Oklahoma went three-and-out, with the possession ended when a Bradford pass to Joe Finley was emphatically broken up by Buff safety Terrence Wheatley. The ensuing punt was returned 31 yards by senior Chase McBride, giving the Buffs the ball at midfield to start their game winning drive. A sixteen yard pass from Hawkins to freshman wide receiver Kendrick Celestine, making his first career start, gave the Buffs all the yards they needed. Three runs set up the Buffs at the Oklahoma 27 yard line, and Eberhart’s 45-yarder sailed through the uprights as time expired, giving Colorado an unlikely 27-24 win over Oklahoma. The game statistics bore out the fact that the win was not a fluke. Colorado had more first downs than Oklahoma (19-12), more rushing yards (161-118), and more passing yards (220-112). The Buffs held the ball for almost 39 minutes, including 21 minutes in the second half. The Sooners, who had been converting third down attempts at a 52% clip for the season, were held to just one conversion in nine attempts against the Buffs. Overall, the 230-yard offensive output by Oklahoma was a full 332 yards below their season average. What to make of the Buffs, now 3-2 (1-0 in Big 12 play)? Up next was Baylor on the road. The Bears were also 3-2 on the season, but their wins were over Rice, Texas State, and Buffalo – not exactly the upper echelon of college football. When faced with decent competition, Baylor fell hard, losing 27-0 to TCU, and 34-10 to Texas A&M to open Big 12 play. Still, the Bears represented a road game, and the Buffs had yet to win a road game under Dan Hawkins. Then again, before Saturday, the Buffs had yet to beat a ranked team under Dan Hawkins, and had lost 14 games in a row overall to ranked opposition before beating the Sooners. One bad streak out of the way; another one to be faced the following weekend in Waco. The Buffs had heard it before: “close loss”, “moral victory”, “good effort”. That is what losing teams hear on their way to a 2-10 season. Yes, CU had led No. 9 Georgia throughout their game in Athens in 2006, but had fallen 14-13 on a last minute touchdown. There was the three overtime loss to Baylor; the “good efforts” against several quality opponents, including against Nebraska in Lincoln. Still, the losses were losses. What the program required to be placed back on the national stage was a signature win. A win over a nationally recognized power to show that the Dan Hawkins hire was not just a long term experiment; a win to show that the best that the Buffs could hope for was more than just a return to mediocrity. Trust me, Cody, this was a “signature win”. The Buffs were the lead story on ESPN for most of Saturday, at least until the top ten became a minefield (five of the top ten in the country lost that weekend). Commentators discussed how Colorado controlled the ball, played solid defense, and took advantage of opportunities. The Buffs had done the same in wins over Colorado State and Miami (Ohio), but no one had noticed. Whether the Buffs could build on the win, of course, remained to be seen. Baylor was seen back in August as a “must win” game on the schedule for Colorado to get to six wins and a bowl. Nothing had changed. Colorado was half way to the magic number of six, but were no guarantees the upset win over Oklahoma would spill over to next weekend. A loss to Baylor on the road, and the program will drift back into the shadows of college football’s national landscape. Still, at least for a few days, Buff fans could dare to dream big. Oklahoma had as much talent, if not more, as any team on the Colorado schedule. A win over the Sooners puts every other game on the calendar in play. A breakthrough season, and not just a six win season, was a tempting thought. With three of the next four games on the road, though, there was no reason to put me in the group drinking the “rematch with Oklahoma in the Big 12 title game” kool-aid. I was still looking for six wins. Win number four next weekend would be a big step forward towards that goal. Here is a link to the YouTube video of the game. These were the words were uttered by Evan towards the end of the third quarter. Evan was my freshly minted brother-in-law (the Oklahoma game marked his and my sister’s seven-week anniversary), who was in town for a conference, and was my guest for the Oklahoma game. Evan uttered these words as the CU ground game, a non-force in the contest to that point, began to churn out yards in the drive that would bring the Buffs to within 24-17 early in the fourth quarter. To be perfectly honest, I hadn’t even considered the thought about winning until that point. Considering the Sooners had yet to score less than 51 points in a game to this point, and considering that against BCS competition (v. Arizona State and Florida State), the Colorado rushing offense had generated something like five yards total in those two games, there was serious reason to be concerned that the Buffs’ much discussed consecutive scoring streak of 226 games would be in jeopardy on Saturday. A 42-7 rout would actually be considered something of an accomplishment. This was still my mentality late in the third quarter. The Buffs were down 24-10, and 14 of the Sooner points had been on gift drives of 11 and 17 yards. I was lamenting the thought of Oklahoma wearing down the Buffs late, getting cosmetic scores to impress the pollsters (remember that this is the same Bob Stoops who, in 2006, rather than taking a knee with less than a minute remaining against the Buffs in Norman, continued to run his offense, scoring late to stretch the score from 17-3 to 24-3). Those gift touchdowns, I feared, would only serve to make an otherwise solid Buff effort look like just another big win by the Sooners. Yet the Buffs were not done. After Evan noted that the Buffs, instead of eschewing the running game, were continuing to pound the ball, the rushing game began to produce results. Seven of the nine plays in the 62-yard drive to pull the Buffs within a touchdown were running plays. Fifteen of the Buffs 23 plays in the fourth quarter were runs. The result was a huge CU win that no one predicted, and that I didn’t see coming. So, where does this victory rank in the CU annals? The 20-10 win over Nebraska in 1986 immediately came to mind. I didn’t think the comparison, however, was valid. Yes, the 1986 win was by a 2-4 team over an undefeated and 3rd-ranked Nebraska squad, and it was a program-altering win. Still, when Colorado defeated Nebraska in 1986, the Buffs were coming off the first winning season (7-5 in 1985) in seven years. There was a culture of losing in Boulder. 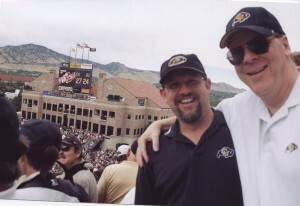 Granted, the 2-10 record from the 2006 season was one of the worst in CU history, but the Buffs had not had back-to-back losing seasons in over 20 years. We were less than two seasons removed from winning the fourth Big 12 North title in five years. The road back to national recognition did not seem to be as steep as it was in 1986 (and indeed the Buffs were “back amongst the others” receiving top 25 votes in the polls the week after the Oklahoma win). The Buffs were now 1-0 in the new era. All we could hope for was to be 2-0 after the game against Baylor. – The Buffs allowed only 590 yards in the past three games. This was the best such three game streak for the CU defense in over thirty years. – The rally from a 17-point deficit ties for the fourth best such comeback in CU history. The best was a 19-point rally in 1961, when Colorado fell behind Kansas 19-0 before winning 20-19. – Hugh Charles rushed for 110 yards against the Sooners, his seventh 100-yard effort (and second in a row). – Surprisingly enough, this was only the second time in school history that the Buffs have won a game on the field goal as time expired (not counting overtimes). The only other time was in 1947, when a 36-yard field goal by John Zisch lifted the Buffs to a 9-7 win over BYU in Boulder. – Dusty Sprague became the 19th player in school history to surpass 1,000 receiving yards in a career. His two catches for 30 yards (including the game tying score) gave Sprague 1,018 yards in his career. – The two touchdown passes against Oklahoma extended Cody Hawkins’ school record of throwing at least one touchdown pass to start a career to five games. Previously, the best was three games with a touchdown pass to open a career, set by Mike Moschetti (in 1998) and matched by Bobby Pesavento (in 2000). – Oklahoma would go on to an 11-2 regular season record in 2007, including a 38-17 demolition of No. 1 Missouri in the Big 12 championship. The Sooners would go on to the Fiesta Bowl, taking on No. 11 West Virginia. The Mountaineers dominated the No. 3 Sooners, 48-28. Oklahoma, at 11-3, would finish the 2007 season with a No. 8 final ranking. This post, about the Oklahoma game, from the 2007 Season, is filed under Game. You can follow any comments to this entry through the RSS 2.0 feed. You can leave a comment. I remember Tommy Hubbard climbing Joaquin Iglesias (spelling?) to get the INT that sparked the 2nd half come back. I remember little Chase McBride getting a rare 20ish yard punt return to midfield to set up the big field goal win. I remember the hope I had from Hawkins beginning to fade to black and then this game happened. Obviously that didn’t pan out, but that game was priceless! That team worked through so many tough times and in retrospect, this was essentially Dan Hawkins’ big bowl game-style victory. Congratulations on the win! I know it wasn’t you out there on the field, but it *was* you rooting for your team through good times, and, most recently, bad times. I bet it feels good. If only Oregon could have pulled it out too! Oh well. Keep up the good work! I hope that the offense will show us that what they did against Miami was the start of what they are capable of. The defence has been awesome. I feel they can hold Oklahoma from running up the score. But only if they are not on the field for 40 min. I don’t look for a win, but for the Buff’s to be competitive. New York Times publishes "At Colorado, a Breach in Football’s Wall". Thoughts? Sept. 28th – UCLA – The New Normal? Aug 29th – Colorado State – Gashed! Sep 22 - Washington State – NEVER Give In! Oct 16 - Baylor and RG III – The End of an Error? Sep 6 - Colorado State – We waited nine months for this? Oct 25 - #16 Missouri – Shutout! Oct 18 - Kansas State – Northwestern Revisited – Barnett Part II? Sep 9 - No. 11 USC – Where have you gone, Ben Kelly? Oct 16 - Texas Tech – Who needs Ricky Williams? Sep 13 - No. 14 Michigan – Hail, No! Dec 3 - The $8 Million Dollar Extra Point / Rooting for Nebraska?? Dec 1 - Orange Bowl Preview: Cheer, Cheer for Old Notre Dame? Sep 10 - Fresno State – Where is Everybody? Nov 19 - Kansas State – Freedom Bowl bound! Dec 1 - Disneyland – Here I come! Sep 27 - No. 10 Arizona – No wins … No hope? Nov 15 - No. 4 Oklahoma – Goaaalllposts … Goaaalllposts! Dec 30 - Washington – Freedom Bowl – Fake punt! Sep 17 - Colorado State – Rivalry? What Rivalry? Sep 13 - UCLA – Buffs down 56-0 … at halftime! Oct 25 - No. 9 Nebraska – What are our school colors again?